Nurses have the background and education that prepares them well as laser specialists. They can obtain laser training through a variety of educational venues. Laser certification increases their employment opportunities and earning potential. Nurses trained in laser technology can establish their own practice or work in physicians’ offices, clinics, hospitals or Botox clinics. The National Laser Institute offers training programs for registered nurses who want to become laser specialists. Registered nurses complete training that includes basics of skin histology, laser physics, safety and clinical applications. Training provides nurses with competence in all phases of laser technology and application, and prepares them for the certification examination. 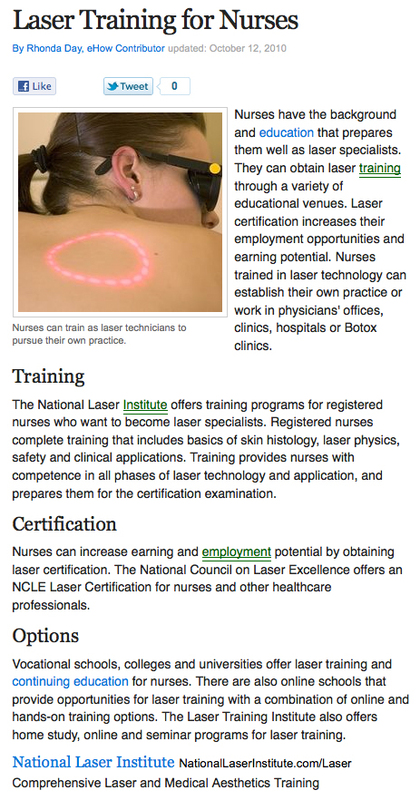 Nurses can increase earning and employment potential by obtaining laser certification. The National Council on Laser Excellence offers an NCLE Laser Certification for nurses and other healthcare professionals. Vocational schools, colleges and universities offer laser training and continuing education for nurses. There are also online schools that provide opportunities for laser training with a combination of online and hands-on training options.